�Longest Motor Life � Rated at 3600 hours � or 7 years at 400 uses per day � the motor in the Jet Towel lasts over 3 times longer that any other dryer on the market. Some of the original models in Japan still work to this day. �Contributes to LEED Points � The Jet Towel�s low energy use helps with the EA prerequisite for Minimum Energy Performance and Credit 1 for Optimized Energy Performance. �Inherent ADA Compliance � At the recommended mounting height the Jet Towel conforms to all ADA regulations for persons in wheelchairs and the visually impaired. �Touch-free Operation � Users put their hand in the wide opening, never touching the dryer. 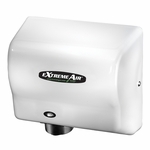 �Most Energy-Efficient � The Jet Towel is the most energy efficient 120V dryer, requiring only 9.8 A to operate.